A woman stabbed her husband in a Mission Hill home early Friday, then chased him down the street with a kitchen knife before he finally collapsed from the fatal injuries, according to prosecutors. Karen Edwards, 36, of Brooklyn, N.Y. is charged with murdering 37-year-old Collins Edwards after an argument inside his mother’s Wensley Street home. It was one of two killings in the Roxbury area; a man in his 20s was shot on Zeigler and Dearborn streets around 5:30 p.m. Thursday. 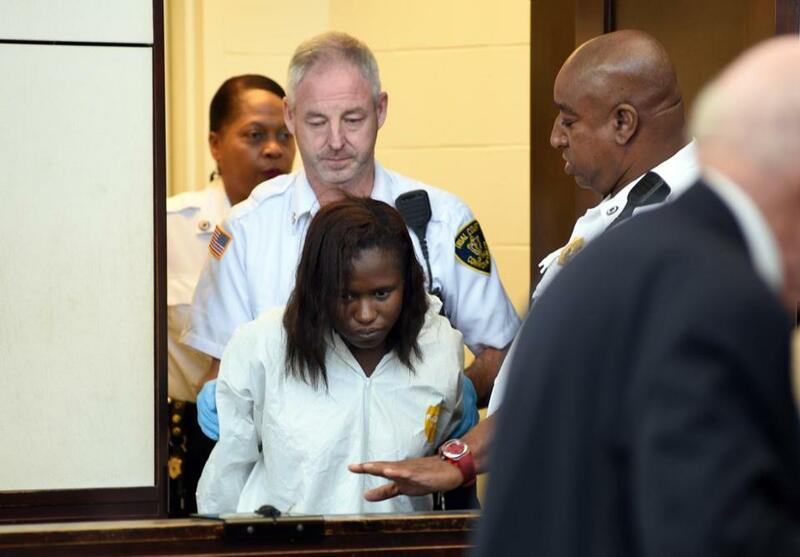 As Edwards was arraigned Friday in West Roxbury District Court, her attorney said she may have been struggling with mental health issues. Karen Edwards threatened her husband, then grabbed a large knife from the kitchen and stabbed Collins in the chest at 12:07 a.m., according to Assistant Suffolk District Attorney Amy Galatis. Collins Edwards ran, and Karen Edwards chased him up the street, Galatis said. Investigators found a knife nearby. Edwards was rushed in an ambulance to Brigham and Women’s Hospital, where he died about 30 minutes later, according to a police report. Officers arrived to find Karen Edwards at the scene with blood on her hands and clothes, according to the police report. Two witnesses told investigators they saw her stab her husband. Edwards was arrested, and she allegedly admitted to the attack. She and her husband had been married for about a year. West Roxbury Municipal Court Judge Kathleen Coffey ordered that Edwards be held without bail and sent her to the Solomon Carter Fuller Center for a 20-day evaluation for competency and criminal responsibility. She is due back in court Oct. 27. The victim’s mother, Myrthlene, said in an interview Friday that her daughter-in-law did not live in the home, but had been visiting at the time of the incident. At the house Edwards’s 11-month old played on the floor near the front door and entryway, both of which were splattered with blood. She said her son was the child’s sole caretaker. Blood stained the ground more than 50 feet from the home. The mother declined further comment. “This is not a good time,’’ she said. In Brooklyn, Karen Edwards’s relatives were shocked to learn that she had been charged in her husband’s murder. “She’s a very loving person, a family person,” said a man who identified himself only as a family friend. He said when he last spoke with Karen Edwards, she told him she was in Boston visiting her husband. Karen Edwards’s mother said she recently received a call from her daughter, but could not understand what she was saying. Residents said they saw firefighters hosing down the sidewalk Friday morning. Police were on Wesley Street Friday morning, taking photos of the scene and of a garbage bin nearby. One woman witnessed the aftermath. Looking out her window, “I saw them wheel a guy from the corner to the ambulance,” said the woman, who declined to give her name. She said she saw a woman walking alongside Boston Emergency Medical Services first responders as they pushed the man lying on a stretcher toward an ambulance. Authorities released few details on the other homicide. No arrests had been made by Friday evening, and the victim’s name has not been released. A man who said he heard the fatal shot, but who asked not to be named, said he was saddened by the violence. “Nobody should go like that,” the man said.